A new Pew Research Center analysis of international census and survey data finds that there is a religion gender gap: Women generally are more religious than men by several key measures of religious commitment, although this pattern is not universal and can vary by religious tradition. Overall, women are more likely than men to be affiliated with a religious organization; women also pray more and are more inclined to say religion is “very important” in their lives. These findings come from survey data collected by Pew Research Center in up to 84 countries that compare men and women in several different aspects of religious commitment. However, the report also finds that in some countries and faiths, men are more religious than women, at least by some measures. For instance, among Muslims and Orthodox Jews, men are more likely than women to attend worship services at least weekly, the new study finds. More broadly, the largest gender gap is in daily prayer. Averaging results across the 84 countries, more women than men say they pray daily by an average difference of 8 percentage points. 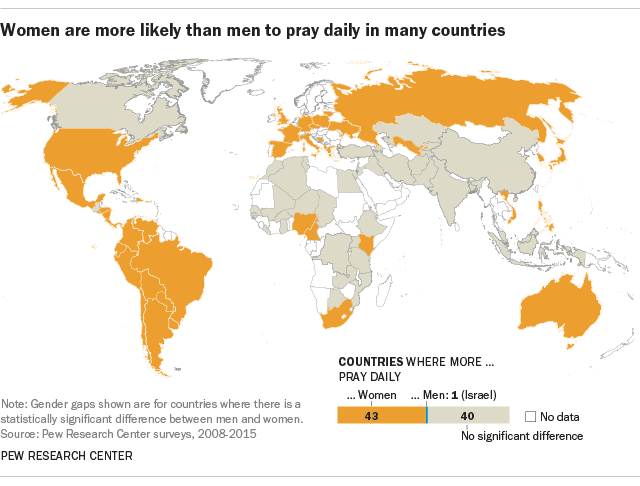 Looked at another way, more women than men say they pray daily in 43 of the 84 countries. Men say they pray more in one country (Israel), and in 40 of the 84 countries there is no significant difference between men and women in daily prayer habits. Religiousness also can be measured by asking people how important religion is to them personally. In more than half of the 84 countries surveyed (46), roughly equal shares of men and women say that religion is “very important” to them. However, in 36 other countries, more women than men say religion is important in their lives – and usually by wide margins. As a result, across all 84 countries, women surpass men in this aspect of religious commitment by an average of 5 percentage points (65% vs. 60%). 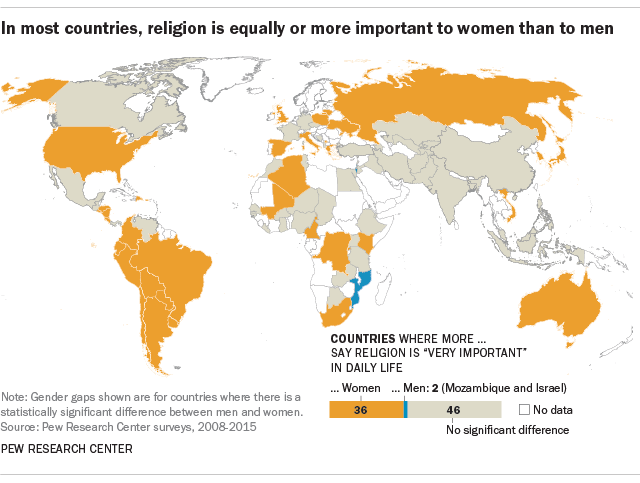 Only in Mozambique and Israel do men say that religion is very important to them more often than women do. The biggest exception to the general pattern of women being more religious than men occurs in weekly attendance at worship services. Across the 81 countries where Pew Research Center data are available for this measure, more men than women attend worship at least once a week (48% vs. 42%). This attendance gap is largely driven by 27 countries in the survey with large Muslim populations. In many Islamic societies, men are expected to attend communal Friday worship services in the mosque, while women can fulfill this obligation either inside or outside the mosque. There are similar religious norms regarding worship attendance among Orthodox Jews in Israel. As a result, men in these 28 countries report far greater rates of attendance than women, often by margins of at least 20 percentage points. By contrast, in countries that have large Christian populations (30 of the 81 studied on this measure), women are more likely to report attending services weekly. And in 23 other countries, men and women report attending about equally. There are instances when the religious gender gap is nonexistent or too small to be significant. For example, men and women display similar levels of belief in the spiritual concepts of heaven, hell and angels.